The revving of motorcycle engines filled the air. Children’s faces lit up and their laughter threatened to drown out even the most powerful bike. According to Bobby Lasseter, who is a member of this very special committee, the bikers just wanted to “take (the children’s) minds off of the troubles that they have been through.” And they did- with a little Christmas magic. As part of the 28th annual Austin Motorcyclists Toy Run, motorcyclists in Central Texas braved the rain recently to make sure that abused children in the community would receive a touch of Christmas magic this year. It’s angels like these who help break down stereotypes, give it their all, and bring hope into the hearts of children. For many of these children, suffering has simply been a way of life. Until recently, safe shelter, warm beds, fresh meals, kind hearts, and of course Christmas gifts, had all been wishes that were left unfulfilled. But thanks to these bikers and the individuals, organizations and businesses that support them, the children at the Helping Hand Home in Austin, Texas will all see a very special glow this Christmas. 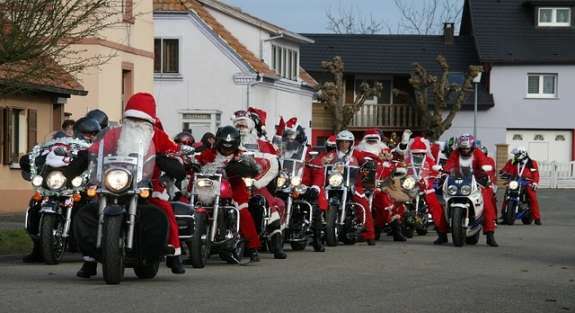 As hundreds of bikers arrived to deliver gifts of kindness and generosity, it was possibly their presence, and not even the presents, that mattered most. ChristmasGifts.com would like to welcome each and everyone of our readers to make a little magic in your own communities this holiday season. Speak with local churches, homeless shelters, homes for abused and displaced kids, and other organizations who can point you in the right direction. Drop off a box off mittens and hats to your local elementary school. Round up some nonperishable goods for the food bank. Or simply give the gift of time. For Christmas 2016, you can be an angel too! 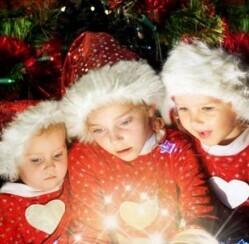 Do you know of a Christmas angel who spreads magic during the holidays?